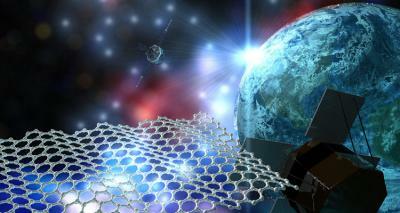 The Graphene Flagship has announced preparations for two new experiments in collaboration with the European Space Agency (ESA), to test the viability of graphene for space applications. Both experiments will launch between 6-17th November 2017, testing graphene in zero-gravity conditions to determine its potential in space applications. One of the two experiments (named GrapheneX) will be fully student-led, by a team of Graphene Flagship graduate students from Delft Technical University in the Netherlands. The team will use microgravity conditions in the ZARM Drop Tower (Bremen, Germany) to test graphene for light sails. By shining laser light on suspended graphene-membranes from Flagship partner Graphenea, the experiment will test how much thrust can be generated, which could lead to a new way of propelling satellites in space using light from lasers or the sun. The other experiment will run concurrently and will investigate how graphene can improve efficiency in heat transfer in loop heat pipes – cooling systems used extensively in satellites and aerospace instruments. The experiment is a collaboration between Graphene Flagship partners at the Microgravity Research Centre, Université libre de Bruxelles, Belgium; the Cambridge Graphene Centre, University of Cambridge, UK; Institute for Organic Synthesis and Photoreactivity, National Research Council of Italy (CNR), Italy; and Leonardo Spa, Italy, a global leader in aerospace, producing of a variety of components and systems for space applications.